The Electro Scan is the new generation water and waste treatment which replaces the of original Lectra/San System. The Electro Scan discharges are safe for environmentally sensitive areas and Electro Scan consistently controls the electrodes to reduce power consumption by up to 36%. The LCD display provides detailed information and lists current system status. It also stores historical data for a variety of diagnostics. 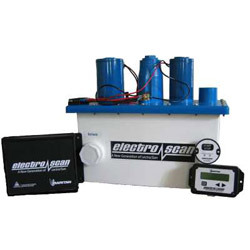 The electro scan utilizes electrodes which temporarily convert salt water into a powerful bactericide. The treated waste water then safely and conveniently reverts back to its original state of salt and water. No unnatural or harmful chemicals enter our environment. The design of the treatment tank optimizes the thoroughness of treatment by forcing the bactericide and bacteria into direct contact, effectively killing viruses and bacteria. The electro scan can be installed with one or two marine toilets to form a complete sanitation system. Pressing the "START STOP" pad activates the treatment cycle. The toilet(s) can be interfaced to provide one touch toilet flushing and treatment activation. Once the treatment solution reacts with bacteria and waste, it reverts back to salt and water. When the discharge enters the marine environment, virtually all pathogens have been eliminated.